Guests who spend time in Disney’s Animal Kingdom can travel across the world and enjoy plenty of amazing attractions and experiences which are both thrilling and unforgettable. While guests who visit the park tend to head straight for popular attractions and shows like Festival of the Lion King, Avatar Flight of Passage, Na’vi River Journey, Expedition Everest, or Kilimanjaro Safaris, there are plenty of other experiences which sometimes can be overlooked. These overlooked attractions tend to be less popular than others but that does not make them any less enjoyable! Those who want to make the most of their time in Disney’s Animal Kingdom definitely need to slow down an make sure that they don’t miss out on any experiences which they might have otherwise overlooked. Here are eight things that guests might be missing in Walt Disney World’s Animal Kingdom. Many guests who visit the village of Harambe in Disney’s Animal Kingdom tend to head straight for the very popular Kilimanjaro Safaris. While that attraction is incredibly popular and shouldn’t be missed, there is another experience found near its exit which often goes overlooked by guests. The Gorilla Falls Exploration Trail continues the experience of Kilimanjaro Safaris and brings guests on a beautiful self-guided walking tour through lush forests and greenery. Along the way guests can enjoy up close encounters with animals like meerkat, Grevy’s zebra, and gorillas. Taking some time to quietly wander through the Gorilla Falls Exploration Trail is a fantastic way to spend time in Disney’s Animal Kingdom. 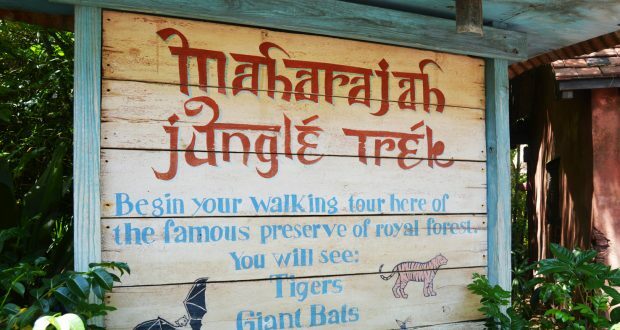 Similar to the Pangni Forest Exploration Trail is the Maharajah Jungle Trek in the Asia section of Disney’s Animal Kingdom. This self-guided walking tour invites guests into the Anandapur Royal Forest where they can explore lush temple ruins, beautiful greenery, and exotic animals. The highlight of the Maharajah Jungle Trek is the up close encounter with Asian Tigers who inhabit gorgeous temple ruins. Guests will be sure to spend plenty of time enjoying the wonderful details and animals found along this walking path. Guests who are looking to learn more about the behind the scenes activities at Disney’s Animal Kingdom should hop aboard the Wildlife Express Train. The station can be found just outside the exit of Kilimanjaro Safaris in the Africa section of the park and brings guests on a peaceful journey through backstage areas offering glimpses at animal housing and veterinary facilities. Guests can listen to a narration discussing the behind the scenes goings on at the park and then disembark at Rafiki’s Planet Watch where they can continue to enjoy learning about conservation and animals. Part of Rafiki’s Planet Watch is the Conservation Station which invites guests to continue learning all about the environment, animals, and operations at Disney’s Animal Kingdom. Guests who spend time in the location can watch veterinary procedures, learn about the diets that animals in the park maintain, and even step into the rainforest in the immersive Song of the Rainforest experience. With so many wonderful ways to further enjoy time in Disney’s Animal Kingdom, guests definitely should not overlook the Conservation Station. Guests who find themselves on the pathway between the Africa and Asia sections of Disney’s Animal Kingdom might pass by a beautiful and unique form of entertainment and never know it! DiVine is a performer who is camouflaged with makeup, stilts, greenery, vines, and plant life to look like a living, breathing plant. She moves slowly and often blends into the lush surroundings, but guests who spot DiVine and pause to enjoy her beauty will be blown away. Guests who spend time in Dinoland in Disney’s Animal Kingdom often head straight for the thrilling Dinosaur and often overlook several other experiences in the area. A great attraction that guests should be sure to enjoy is TricerTop Spin which is a classic spinner attraction that has them board green triceratops for a whirl around the skies of Dinoland. Offering beautiful views and gentle breezes, guests should be sure to stop and enjoy TriceraTop Spin. Festival of the Lion King may be a popular one, but Finding Nemo is another stage show not to be missed which brings a classic Pixar story to life. Finding Nemo – The Musical brings the story of Finding Nemo to the stage through larger than life puppets representing the loveable characters. Housed in the Theater in the Wild in Dinoland, this stage show sometimes is overlooked by guests who head for other popular attractions nearby, but it is so amazing that is should not be missed! While there are plenty of places to enjoy meals in Disney’s Animal Kingdom, there is one full service location in the Asia section of the park which tends to be overlooked by guests. The Yak & Yeti Restaurant features two floors filled with beautiful artwork, artifacts, and collectables from Southeast Asia which guests can enjoy while dining on a Pan-Asian inspired menu. Yak & Yeti Restaurant is open daily for lunch and dinner and serves up delicious options like Crispy Honey Chicken, Korean BBQ Ribs, and Seared Miso Salmon that guests are sure to love!